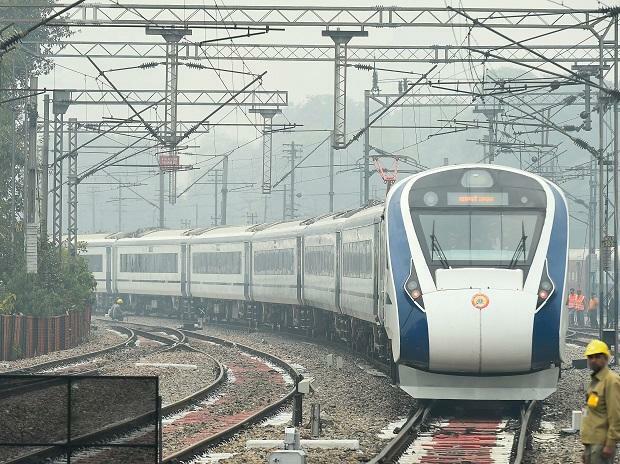 The main driver's screen and some side windows of the Vande Bharat Express were damaged when the train was hit by stones during its Varanasi-New Delhi journey on Saturday, official said. Northern Railways Chief Public Relation Officer said a shower of ballast came flying towards the train near Achalda in Uttar Pradesh when the Dibrugarh Rajdhani, crossing on the adjoining line, run over a cattle. "The stone chunks hit the driver's windscreen and one each side outer glasses of windows of coach numbers C4, C6, C7, C8, C13 and two glass panes of C12, causing damage," the CPRO said. The statement said the technical staff on board the train assessed the damages and after careful careful examination the train was found fit to run. "So it carried on its onward journey to its destination station at its normal speed. The Train has since then reached New Delhi railway station at 11.05 pm," it said. The Northern Railways CPRO also said officials attended to the damaged windows and put on safety sheets to ensure passengers are not inconvenienced in any way during its Sunday journey. The train left for Varanasi Sunday morning on its scheduled time. Prime Minister Narendra Modi had on February 15 flagged off the semi-high speed train from New Delhi Railway Station. Its commercial operations began on February 17.